The What: Christie has introduced a new front access video wall cube product that enables seamless high performance rear projection video wall displays with minimal installation and maintenance space required. All the benefits of Christie’s latest and brightest Entero HB DLP LED-based technology display are available in a platform that allows video wall cubes to be positioned directly against a rear wall, removing the need for maintenance space behind. The first front access cube model, the Christie Entero HB 70-inch HD, will be joined by other front access models including 50-inch and 70-inch SXGA+, and 72 inch WUXGA. The What Else: Christie’s front access system design addresses space limitations with the ability to put the cubes up against a wall without compromising performance, image quality or reliability. Customers can gain space in their control room design by placing cubes directly against a wall, while maintaining the narrowest screen gaps and utilizing a smart air flow design for system ventilation. 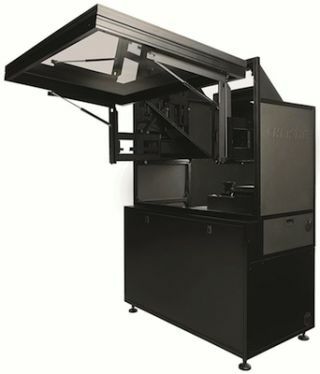 The front access system is designed to take advantage of the Christie Entero HB systems’ User and Web Interface to enable remote control release of the screen for front service access as well as remotely performing fine geometry alignment by the integrated 6-axis geometry alignment system. Screen and geometry control are provided via the remote control, computer or tablet. The screen is on a slide mechanism and opens up with reliable and consistent positioning, via remote activation of solenoids, providing full access to the internal electronics from the front of the cube array system, allowing for exceptionally quick servicing and minimal downtime during maintenance operations.